Welcome to Author Maria Grace! I am so excited about launching a series of weekly guest posts on my Blog, and I could not be more delighted to have the lovely and talented Maria Grace as my very first visitor! 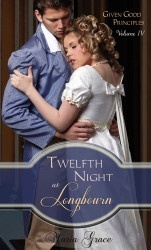 Maria has just released her latest book, a novella, called Twelfth Night at Longbourn, which concludes her ‘Given Good Principles‘ series with a delightful and seasonal tale centred around Kitty Bennet. There is a lovely excerpt below which ties in beautifully to Maria’s post about her love of research and, in particular, the tastes and smells of food and drink in the Regency era. I am probably the odd one out. I actually love the research process. It is probably one of my favorite things about writing historical fiction. As a kid, I loved to read reproductions of old cookbooks—and honestly I still do. Since, with three boys, I spend a lot of time in the kitchen, and in the mundane chores around the house. Vintage cookbooks often offer insight into those same activities from eras long past. Knowing how people cooked and ate, cleaned their homes, their clothes and themselves, the medicines they prepared and the maladies they prepared them for all paint such a vivid picture for me of what life was like, I feel a little transported to that era myself. That is the crux of world-building, a skill every writer must have whether they are creating their own fantasy world, or recreating an historical one. So I indulge my researching-itch with period references whenever I can. Digitized period books have made my efforts so much easier. I now have hundreds of such references on my hard drive, with access on my phone if I really want. Sometimes it is a bit of a head trip, referencing a 1794 cookbook for instructions on cleaning fruit juice stains from silk using the WiFi connection on my cellphone! The things writers do for their craft! I frequently find myself researching out little details that I could otherwise gloss over, since, really, they aren’t THAT important to the story. 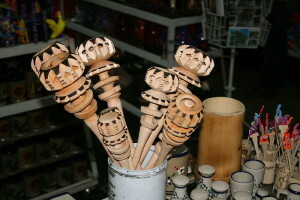 Things like specific items served at meals or teas, what did they taste and smell like. Were they just placed on the table, or was there some particular way they were presented? Were there special serving vessels used or just everyday dishes and did those dishes communicate anything about the host or hostess. These are little things which don’t necessarily carry the plot, but they can transport the reader into the story world and that is important to me. One place the characters in my most recent book visit is a Regency-era coffee house. Preparing drinking chocolate was a time consuming, labor intensive process, beyond the means of many, so coffee and chocolate houses sprung up to meet the demand. Preparing drinking chocolate took at least thirty minutes and a number of specialized tools. A specialty chocolate grater would be used to shave chocolate from a solid tablet of chocolate and spices like cardamom, aniseed, cloves, and bergamot. The powdered chocolate would be added to a large pan containing water, milk or possibly a mixture of water and wine or water and brandy and placed over heat and brought to a boil, while constantly stirring to prevent scorching. The cook would then remove it from the heat and use a special tool, known in England as a chocolate mill (in France a molinet, in Spain a molinilla) to beat it, adding eggs, flour, corn starch or even bread to thicken the mixture. After beating, the pot was returned to the heat and brought to a boil again while stirring constantly. At this stage, cream might be added. The chocolate mill would be employed once more to fully blend the mixture and raise the head of frothy chocolate expected. The finished drinking chocolate would be transferred to a special chocolate pot for service. 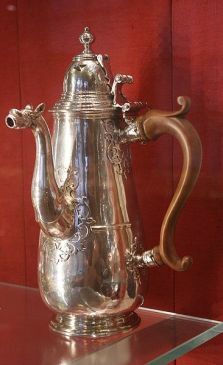 A chocolate pot was taller and straighter than a tea pot, with a shorter spout than a coffee pot, placed high on the pot. It also sported a hinged finial on the lid to allow a chocolate mill to be used while the lid was down to prevent splashing. 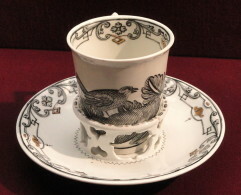 Chocolate was served in cups that were taller and narrower than coffee or tea cups. Their unique shape made them more likely to spill, so special saucers known as coffee stands developed to steady the unstable cups. Chocolate was typically served at breakfast, but if taken during the day, dainty confections might accompany it. For example savoy biscuits and pound cake, both of which represented a fair amount of kitchen labor themselves. These are recipes taken from period books handwritten by cooks and housewives of the era, including the original abbreviations and spelling errors. Beat up 12 eggs, half the whites. Strow in a pd of loaf sugar, sifted. When the eggs & sugar are beat white as cream, put in 4 spoonfulls of orange flower water, a pd of the finest flower, dryed & sifted. Mix all well together. Make them into what shapes you please. Bake them on tin plates, first flowerd, in a slack oven. These are proper with tea in an afternoon. Learning all these details is wonderful, but the challenge comes in using them in an authentic way, weaving in the details to build the world, not make the reader feel like they are in the midst of a history lesson. Here’s an excerpt from my book Twelfth Night at Longbourn where I try to do just that. Kitty shifted the basket on her arm. The streets of Meryton bustled with foot traffic, but no one stopped to speak to her. Several mothers, their daughters in tow, crossed the street or ducked into shops, no doubt to avoid contact with her. None looked at her or smiled in her direction. She might as well have been invisible. She stared at her feet. Her hand-me-down nankeen half-boots, mud spattered and layered with road dust, needed a good cleaning. Since no one accepted her calls, and no one called on her, she would have plenty of time to attend to that task later this afternoon. Her throat tightened hard around the lump she could not swallow back. She must not cry. How could Lydia have done this to her? Wait. Was that—yes, Charlotte and Maria Lucas, there, near the milliner’s. Surely they would not cut her. “Had we known you were coming to town today, we might have walked together.” Charlotte smiled as though Lydia’s transgression never happened. No wonder Lizzy considered her such a dear friend. “Excuse me. I must nip in here for a moment.” Maria pulled the shop door open and disappeared inside. Not Maria, too! Kitty gulped hard and sniffled. Kitty mumbled and nodded as she followed Charlotte down the street. She stooped to hide within her poke bonnet’s generous brim. That is what they were for, was it not, to hide a young woman from the censure of society? The dark walls, covered with too many decorations, invited them to find a place in the crowded coffee house. Conversations hummed around her. How could so many be smiling when misery enveloped her like a red riding cloak? Kitty picked up a piece, examined it, and put it down again. She sighed. At least Charlotte would permit her the luxury of a little dissatisfaction. She blinked hard and turned her face aside. Kitty picked up the crystal glass of lemonade and sipped the slightly too sour mixture. She stared into the cloudy liquid. A few lemon pips swam along the surface. How like Charlotte to be so concerned for her feelings—not that it helped, but it was very sweet. “Even if she does not, I doubt she will ever rival Lydia.” Kitty smoothed the tablecloth under her glass. “No.” Kitty snapped a biscuit in half. Pale crumbs littered the blue table linen. “The Bonds still blame Lydia for Olivia’s elopement. You might think Margery Bond would be sympathetic. She has received as much censure as I. She said I am only getting what I deserve for being related to such a wicked girl.” Kitty covered her face with her hands. “Thank you. It is some comfort.” Not that she actually felt any ease, but it was the right and proper thing to say. Kitty dabbed her eyes with the edge of her sleeve. How could she have forgotten a handkerchief? “I thought you did not like children.” Charlotte’s eyebrows climbed under the edges of her droopy bonnet. Was it possible? Might she escape to a place where her disgrace was unknown? Surely the Gardiners would be willing, and Papa could not object if they did not. She blinked hard, her lips turning up just a mite. This entry was posted in Guest Posts and tagged Maria Grace, Pride & Prejudice inspired, recipes, Twelfth Night at Longbourn. Bookmark the permalink. 4 Responses to Welcome to Author Maria Grace! I love the research that goes into the story, that makes all the details so much for realistic. The excerpt has me hooked and I want to read more. Thank you so much for sharing! Thank you for stopping by, Andrea! It’s a fab recipe, isn’t it, and the excerpt really does make you want to read more! Paperback just available now, as I understand it! Thanks for a great post, ladies! I love your attention to detail, Maria Grace, and the random bits of fascination that make their way in your lovely stories! Thanks for stopping by to read and comment, Joana! It’s a great post, isn’t it? Makes me want a steaming mug of hot chocolate right now and a good romance to read!